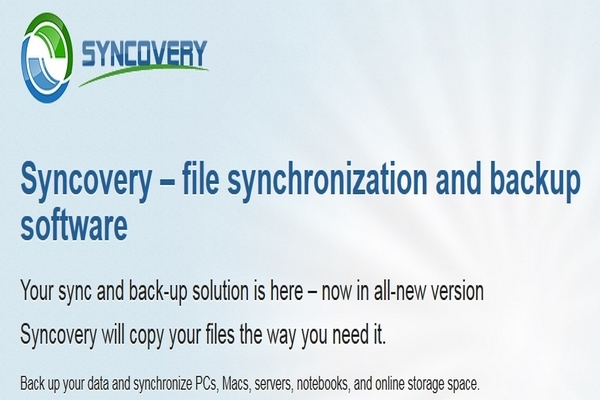 Back up your data and synchronize PCs, Macs, servers, notebooks, and online storage space. You can set up as many different jobs as you need and run them manually or using the scheduler. Syncovery works with local hard drives, network drives and any other mounted volumes. In addition, it comes with support for FTP, SSH, HTTP, WebDAV, Amazon S3, Google Drive, Microsoft Azure, OneDrive, SharePoint, DropBox, Box and many other cloud storage providers. You can use ZIP compression and data encryption. On Windows, the scheduler can run as a service â without users having to log on. There are powerful synchronization modes, including Standard Copying, Exact Mirror, and SmartTracking. — Synchronizes or Backs Up Files and complete folder structures in different locations, such as PCs, Macs, laptops, or online storage. There are no limits in terms of file sizes, the number of files, or filename lengths. The program fully supports Unicode characters so that it can copy filenames in all languages. — Each sync job is saved as a profile so that you only need to specify the settings once. — Copy several files in parallel. Schedule the synchronization of your data on a backup hard disk at a convenient time each day, or as frequently as you wish. You can also schedule profiles to run upon shutdown or log-off. The scheduler can launch different jobs in parallel or sequentially. On Windows, the scheduler can run as a service â without users having to log on. — Internet and Cloud Support. Supports various Internet protocols, including FTP, FTPS, SFTP/SSH, WebDAV, SSL, HTTP, as well as these cloud services: Amazon S3 and compatible services, Microsoft Azure, Rackspace Cloud Files, Microsoft OneDrive (formerly SkyDrive), Google Drive and Google Docs, DropBox, Box.com, and more. — Compression and Encryption Support.